Fercell’s proposed solution was to completely remove the existing fan and replace it with a Geovent MSQ centrifugal fan set. 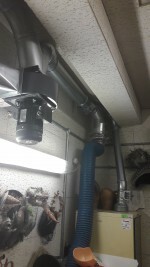 Fercell’s engineer installed a new correctly-sized and balanced ducting system, linked up to the connection of an articulated arm and fume cabinet. The fumes are now collected by a flexible arm so there is more space to work and move around in, and fumes are externally disposed of.